Check out our YouTube page for an archive of our videos! Our community playground build time lapse video! Check out our video series above featuring our parents telling why they chose Discovery. Are you Discovery Proud? What does it mean to be an All-Star? A short movie featuring moments from our first year in operation. Discovery Academy has had the privilege of having several great guest speakers over the years including Congressman Bob Latta, Astronaut Shane Kimbrough, and MMA Champion Brandon Copeland. One of our third grade parents came to the school to talk about health and nutrition with our students. See the story here! Our grand opening event at our new building was covered by several news stations including Channel 24 (video above) as well as Channel 11. Here's the story from August 7th, 2016. On Tuesday, November 16th, 2013, Astronaut Shane Kembrough spoke to our students about going into space, his time on the International Space Station, and whether or not he has ever seen any aliens! The Toledo Blade was there to cover the event, and several of our students made it into the paper. Here's the story! On August 27th, 2013 School Leader Mr. Campbell was invited to do radio interview on WSPD 1370 with Fred LeFebvre for his FREDucation segment to talk about Discovery Academy. Click below to listen to the interview. Click here or on the picture above to read the article about our Open House in the Toledo Journal from August 7th, 2013. The article is located on page 7. 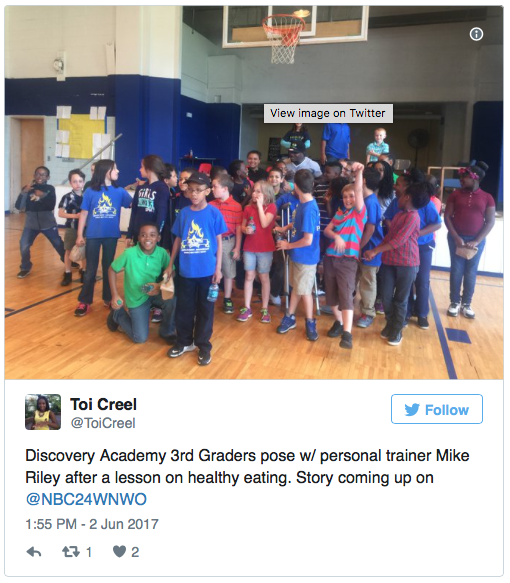 For those of you who were not glued to your televisions at six o'clock on a Friday night, you may have missed the WTOL News feature on Discovery Academy and our August 2nd, 2013 Open House near the beginning of their broadcast. We had no idea they were coming, but we were overjoyed when they asked to do a piece on us. Click here, and let us know what you think about the news story.